Are you into Oriental cuisine? Do you like sushi and sake? If you fall into this category, you can benefit from this coupon. 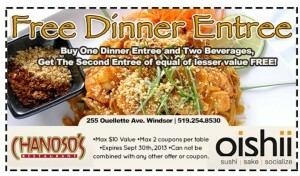 You can use this OISHII AND CHANOSO’S RESTAURANT FREE DINNER ENTREE COUPON. Take a friend and head on down there. 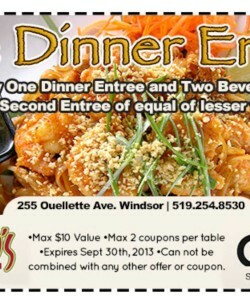 You buy one dinner entree and two beverage and get the second entree of equal or lesser value for free. Now if you are a college student, you know you can truly benefit from this. But it also applies to anyone. Who wouldn’t want to save a few dollars? I know I definitely would. You can use 2 coupons per table which means your guest list has just been upgraded from 1 to 3! 4 people and 2 get to eat free. Maybe you’re wanting to take someone out for their birthday or just to hang out. This would be a great time to do so. Good food and good friends. It really doesn’t get any better than that, does it? Take some time, pull out your calendar and see what day in September works well for you. Yes, it only runs for September, but you have some days left to enjoy. They have more than sushi, so if your dinner party guests don’t care for sushi, guess what? You can still have a dinner gathering here. It’s definitely in your cards to head on down there. Time is of the essence and you should get moving! Don’t delay. Time is running out and you’ll be looking at the end of the month before you know it. What are you waiting for? Call your friends and plan this dinner ASAP! Your sake and social buttons are being pushed. Have some fun!